IFRS Board consider that ECL that based on current credit condition plus estimated probable condition in the future will reflects fairvalue accounting in a more accurate manner, that probably will create higher volatility of loan loss provisioning, complicate financial planning and hit bank’s common equity tier 1. We are now having around 500 days to be ready in implementing PSAK 71 Intrumen Keuangan, Indonesian version of IFRS 9, which will be effective on 1 Januari 2019. 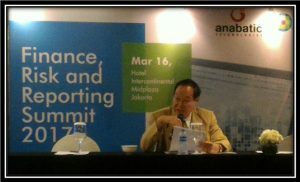 By December 2017, assisted by IAI and IAPI, all Indonesian accountants – ie. internal accountants, internal auditors and external auditors – should be ready in entering 2018 as the year of final trial and error in accounting process and auditing process of IFRS 9. We encourage comparability and consistency in apllying IFRS 9, the use of competent economic information carefully, practicing GCG and sound management judgement in determining ECL. We encourage an extra disclosure of ECL assumption, macro data, business model, econometrics, and impact on financial strategy regarding IFRS 9. Becoming an expert in ECL approach and modeling, ie. 12 months or life time ECL. To a certain extent becoming an expert using economic judgement base on a sound econometric calculation. Agreed upon supportive information for IFRS 9 ie. ; competent source of information and information specification GDP Growth, inflation, unemployment, real estate industri condition, the Fed rate, SUN rate etc. Becoming an expert in the new era of hedge accounting, increase the capacity to judge on the circumstances where 80 % – 125 % treshold could not be applied, consider wisely the possibility of hedging mismatcch and macro hedging. Although a company applying amortized cost, fairvalue option ie FVTPL or FVOCI should always been analyzed properly. Applying the new era of banking earning management, in relation with the depletion of loan portfolio’s earning power dan capital ratio.. Various seminar and professional training to address the above topics, a serial professional exams and certification on IFRS 9. Modeling, ie. (1) Business Model, (2) Stress Testing Model and (3) Econometric Modeling based on agreed upon a certain quality of general information, agreed upon competent source of public information and agreed upon sound judgement criteria, national wide. Changes in bank’s behaviour, changes in investor’s behaviour, the New Business Model and Risk Management in banking industry and New Database Management System based on IFRS 9. The new valuation system based on IFRS 9, combining past data with future probabilities which are not always ceteris paribus. The profession should, learning to regocnize, differentiate and categorize positif forward looking and negative forward looking, and its impact to expected credit losses. Corporate implementation plan and agenda for IFRS 9. Well positioned IFRS 9 amongst other standards, and how to build a forward looking accounting policy. We are dealing with risk averse investor. A voluntary disclosure and a more frequent press release regarding any strategic condition might be favourable for any reporting entity. Lets build a symetry information landscape by disclosing ECL process in banking industry FS and capital market. In relation with IFRS 9, all FS prepares and FS Auditor should be aware of the possibility FV Accounting Fraud investigation by FSA or KPK.